Bilal is a Catastrophic Injury Solicitor at CFG Law. Throughout his career, he has been involved in several multi-million-pound settlement cases with leading Queen’s Counsel. Bilal often visits clients at their homes from the outset, in order to understand the important issues in their lives. He implements a multi-disciplinary team approach to provide support to the client and also their loved ones. 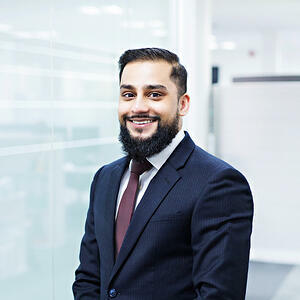 Bilal also has an excellent understanding of the complex issues that can arise after having sustained serious and life-changing injuries. He aims to encourage and promote a collective approach in dealing with serious injury cases, which includes building a close relationship not only with clients but also their family members and close friends. Providing compassionate support to clients and their families in times of need. Adopting meticulous attention to detail and thorough examination of each case to ensure clients have a good understanding of all aspects of their claim. Building a close relationship with clients to ensure all of the support they need is put in place as quickly as possible. The culture and approach to always putting the clients’ needs first. The working ethos that encourages and promotes teamwork, not just between solicitors on a case, but all colleagues throughout the Practice. Being part of a firm renown for championing justice for those who have suffered serious injuries. The evolving medicine behind brain injuries and exploring changes in neurology to help with the diagnosis of brain injuries. Traumatic spinal injuries and orthopaedic injuries, including amputations. Football (an avid supporter of AC Milan), cricket and boxing, as well as walking treks, visiting national parks and holidays abroad.